← What do you Read? 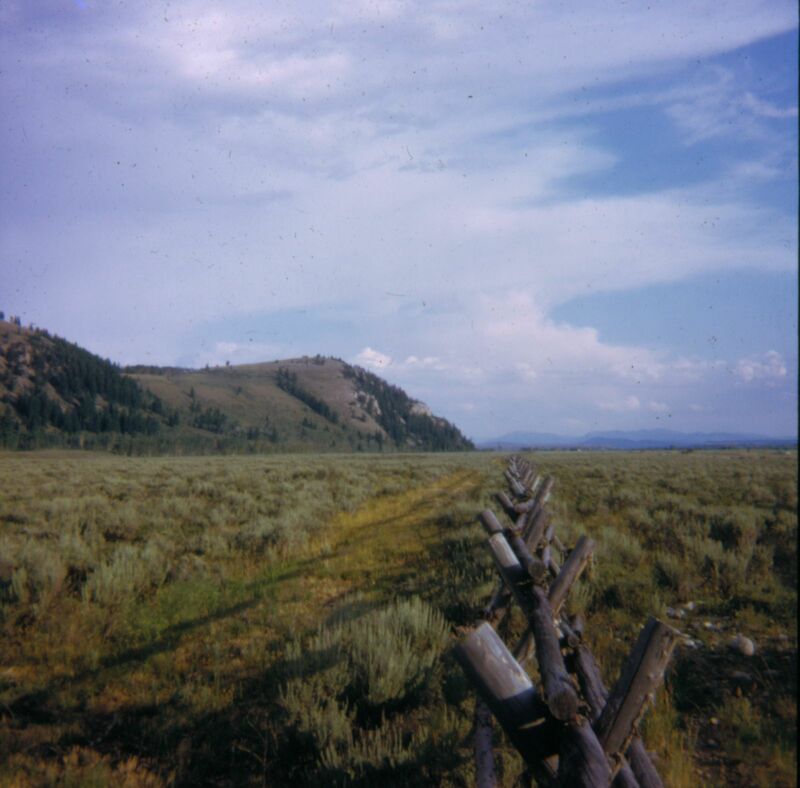 Taken with 8-mm B&H Filmo, 1954: Note '40's coupe passing by. It’s about 1954. The place is Roger Williams Park in Cranston, RI. A young father and his 5-year old son are swinging the 2-year old son between them. The arc of their swing peaks right above the adjacent duck pond. Mom, with long dark hair and a woolen spring coat operates the Bell & Howle 8-mm Filmo movie camera, neatly cutting off her husband’s head for many of the 16 frames that pass the shutter each second. In the background we see cars passing by, coupes and sedans, dating mostly from the late 1930’s and ‘40’s (new cars were only beginning to become plentiful in ’53). The 8-mm silent movie camera was the high-tech item for most families at the time. Sound recording with film was also available but it was priced well beyond the means of most Americans. 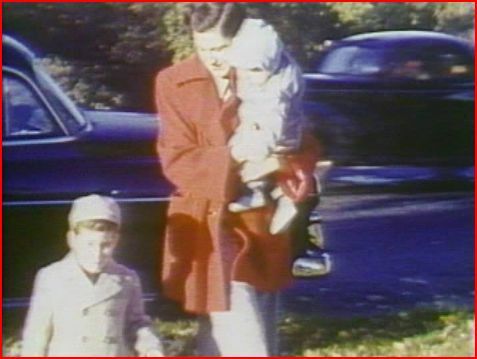 Each small 8-mm reel (actually 16-mm film that was recorded in 8-mm on opposite sides) on the movie camera promised to deliver as much as four minutes of family posterity (assuming you used regular speed and didn’t make too many mistakes). When the film reached the end of its spool it was necessary to find a dark place where you could open the camera back, extract the film, and re-spool it after turning it over. You were now ready to finish the roll. Hopefully you did not allow too much sunlight to enter and fog the film. My dad rarely wasted any film. He was an expert at changing reels. The only still cameras in our house were Bakelite Brownies left over from the 1930’s or the very basic Falcon that looked like a 35mm but was not. Most were in the popular 126 format. My brother and I were usually the only ones that used these simple to take pictures with (but difficult to load) devices. 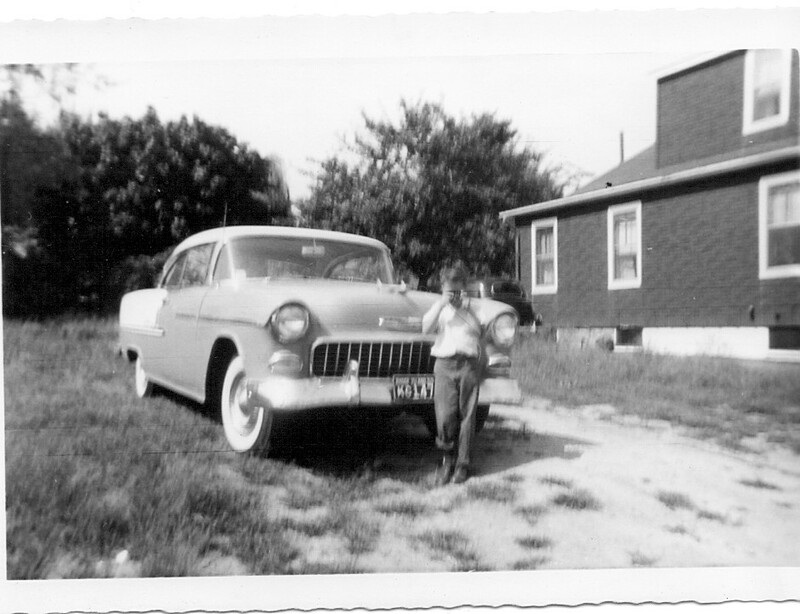 The evidence of our photographic ineptitude shines through in blurry pictures like the one of my brother leaning on the front bumper of the 1955 Chevrolet (the family car was more often than not a Chevy). My brother is taking a picture of me at the same time with some unrecognizable camera. His right pants leg is stylishly rolled up. 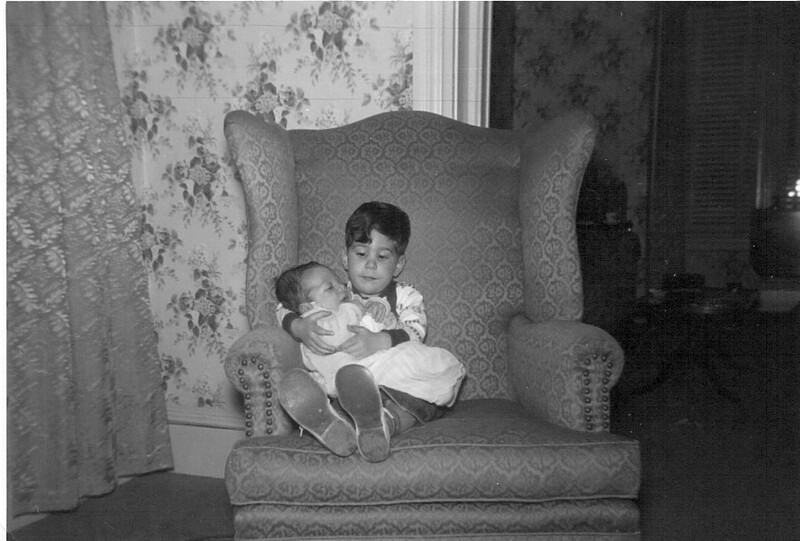 On the rare occasions when our dad took a still shot the results could be nothing less than spectacular as evidenced by the flash photo showing me holding my infant brother while in the clutches of an upholstered wing chair. Dad needed a steady hand to get this nice shot. These cameras accounted for a couple rolls of pictures (12 shots per roll) each year until the 1960’s when Kodak finally took care of that ‘difficult to load’ problem. They introduced the Instamatic line of cameras. 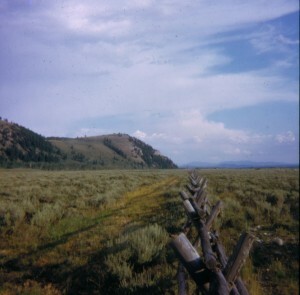 The new film developed specifically for the Instamatic camera line consisted of a drop-in cartridge. That’s all you did; drop it in and close the back cover. A few turns on the film advance and you were ready for fog-free photography. There was an extensive line of Instamatics that culminated in one with variable focus and automatic winding between exposures. That one worked by means of a spring that the amateur photographer wound by pulling on a cord (sort of like the then in vogue Chatty Cathy doll; same mechanism, different application). I never progressed beyond the entry-level model, the Instamatic-100. It took perfectly focused (subject must be at least 6 feet away) square format photos that were of reasonable quality. It even had a neat integrated flash that you could load with Sylvania Blue Dot bulbs (‘if you can see the blue dot, the bulb is good). The 100 served me well right up through the 1970’s. My collection of prints and slides grew and I knew nothing about the 35mm format that had been the vogue among miniature format photographers since the early 1930’s. Everything changed in 1977 when my first daughter was born. This was a moment for celebration and it had to be recorded with style. Long before she was due I outfitted myself with a Minolta SRT-101 35 mm single-lens reflex camera. The process was a little more complicated but the photographs were vastly improved over the fixed focus cameras I was used to. Family movies were still very important and to that end my dad gave me his old Filmo which I now put to use; that is until the next major revolution arrived, the videocassette recorder. My first introduction to the video recorder was the videotape recorder (VTR). It looked much like a reel-to-reel audio tape recorder but it picked up video as well. I used one of these to record many editions of Nova and National Geographic TV shows that I used to enhance the biology classes I taught. The VTR was owned by the school where I worked. It recorded only in black and white but it was a great advance over the old 16mm films we were using. Eventually you could not give away a 16mm projector! The VTR revolution was short-lived. The VTR was devoured by the VCR (videocassette recorder) that came out soon after the VTR. We had our choice between two competing formats, VHS and Betamax. You already know which one survived. The next major household purchase after a VCR player was a VHS videocassette movie camera. It was big, it required large tapes, and it recorded in full color with the addition of great sound. 8mm and Super 8 film were toast. Of course the primary use of the VCR was not watching family movies. It was for watching rental movies. Tape rental stores popped up on every corner. There were the family owned startups, the milk store tape racks, and eventually the national chains. I remember one jewelry store that began renting movies and selling blank tapes. When they had a big sale I would run down there and buy up a few more $5 blank tapes for use at home. If you returned a tape late there was a $1-$3 per day late fee. I remember the many times I would slip a tape in a return slot on a Sunday morning right after church. The VCR had a good run. Then came the CD and its video cousin the DVD. Even the youngest people reading this are familiar with DVD technology. It wiped out all the videotapes on national video rental store shelves (mom and pop stores were gone by now). Technology does not stand still. The introduction of movie DVD’s by mail and instant streaming has all but eliminated dedicated brick and mortar video rental stores. The empty storefronts are scattered all over the United States. The present industry leader is Netflix. My son gave my wife a subscription to Netflix several years ago and we have never looked back. We have noticed that the number of films available for instant streaming to your computer and broadcast to the family TV are increasing all the time. Many films are still not available to download with one low fee and this is due to all sorts of legal licensing arguments going on behind the scenes. As a result there are presently two major delivery options from Netflix: delivery by mail (physical DVD .. send it back whenever you want) or direct instant streaming to your computer and display device (I use a Roku). Some people seem to think that the streamed movies are of an inferior quality when compared to the ones that are available only through the mail. I must agree that there are a lot of dogs in the Instant library; but, there are enough gems to keep your eyes deep in movies for decades. To illustrate my point I will now provide you with a few reviews of superior (IMHO) movies that you can get instantly from Netflix. Try them out and let me know if you agree. If I get enough positive feedback I may make additional lists in the future. In any event, if you don’t like a streamed movie, you can just turn it off after 5 or ten minutes of viewing and go on to another; no extra cost, no tears. NOTE: My list of “already watched movies” at Netflix is 18 pages long! I’ll start with some of the more recently watched films. Links require a Netflix account to access. Doghouse (2009) – Six British guys decide to hang out in a small country town where they can drink, bond, and get away from the daily grind of work or unemployment. Unfortunately the town they select turns out to be a little strange. Nobody is there, except for the women. That might sound like a good thing until they realize that all of the women have turned into ferocious zombies. Be prepared for lots of gore, sick jokes, and sick fun. Don’t take it seriously, just sit back and enjoy. SALT (2010) – Angelina Jolie plays a woman accused of being a Russian sleeper spy in the USA. She doesn’t stick around long after the accusation is made. Her flight and subsequent activities make for some of the most incredible (and unbelievable) action shots I have ever seen. This movie doesn’t stop for a moment. There is a really interesting plot and tons of violence. You have been warned. I think this is one of the best that Jolie has done. Harvey (1950) – Elwood P. Dowd (played by Jimmy Stewart) lives with his sister, his niece, and an imaginary 6-foot tall rabbit. That should be enough plot to get you interested. I have seen this movie many times and enjoy it more with each viewing. I even saw the original play this past year when it was presented by the Granite Theatre in Westerly, RI. Don’t let the 1950 date bother you. The story is one that will always be fresh. Angus (1995) – Angus is the class fat boy. His main buddy is a skinny little nerd. Life in school is tough for both of these guys. The movie follows them from elementary school all the way to the high school Winter Ball where Angus is elected to be the Winter Ball King. Of course it was a rigged election designed to embarrass him for one last time. This film definitely has Carrie overtones. Angus is the kind of movie that works well for young people and adults. I wasn’t sure about this one but when I eventually played it I was pleasantly surprised. You will be too. More Dogs than Bones (2000) – This is one of those films that is a warning to never believe all the negative ratings some viewers give. It has about as many negative reviews as positive ones. Who’s right? You have to take a chance and decide for yourself. I tried this one and loved it. The movie begins with a Pakistani man flying to the United States to visit his nephew. He is on the same flight as a female mobster who has just learned that the cops will be waiting on the tarmac to pick up here and the million dollars of loot that she is transporting. What to do? Of course she somehow gets the Pakistani man, Raj Lukla, to unknowingly transport her money. Unfortunately the simple plan to immediately get the money back after she passes muster with the police fails. Things quickly get very interesting and messy. Warning: there is lots of violence even though the movie does have a heart. The Skeleton Key (2005) – This one is categorized as being in the suspense and horror genre. That about says it. It’s all quite serious stuff, not fooling around here. Skeleton Key is a very well done horror flick that is not typical. It will not allow you to figure out exactly what is happening until the very end. It just works real well! Oh, it’s about a girl who shows up at an old mansion to become the new caregiver for a seriously ill man and his healthy, but a bit strange, wife. That’s all you need to know. A Little Princess (1995) – It is World War I and a British father enlists in the service as an officer. His wife died several years earlier and the only person he has left is his daughter. He sends his daughter, his Little Princess, to a boarding school in New York where she will be safe. Unfortunately all does not go well and his daughter ends up having a much different experience than she expected. This is a great family film. Don’t let that scare you away. I enjoyed every minute of it. PS: I now take my still pictures with a Kodak digital camera. It also does movies. And yes, I do remember the videodisc that I did not mention above. I had fun using those to show kids how bees communicated with each other … and a good friend of mine (Jerry LaFontaine, a great man who passed away at the young age of 50) invited us and others over to his house for many movie nights, all presented in glorious videodisc clarity. He was always a first adopter! This entry was posted in Modern Technology, Netflix Instant Movie Reviews - Over 70 Films & Series and tagged 8-mm, Angus, Bell & Howell, camera, Doghouse, film, filmo, Harvey, More Dogs than Bones, movie, regular 8, Salt, VCR, videodisc, VTR. Bookmark the permalink.